Why Is Smiley The Perfect Name For This Wonderful Dog? This is a story filled with inspiration if there ever was one. We sometimes tend to overlook the worth and value of a dog when there appears to be something “wrong” with them. But not this time … One fantastic lady immediately saw the beauty in Smiley, a dog that was born blind and with dwarfism. In the article below from CBS News, Jennifer Earl shares with us the inspiring story of how Smiley, despite his limitations, has given countless people so much comfort and joy over the years. 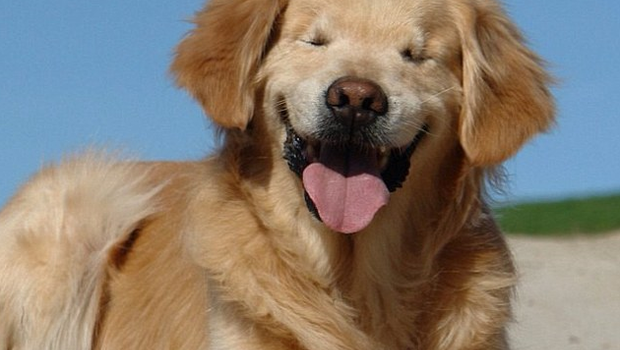 A blind service dog named “Smiley” will never fail to put a smile on people’s faces. The Golden Retriever’s owner Joanne George saved Smiley, who was born with dwarfism and without eyes, from a puppy mill and a death sentence at the age of two. Nearly a decade later, the dog’s story is continuing to help others in need. Shortly after George came to that conclusion, the dog became a certified therapy dog and joined the St. John Ambulance Therapy Dog program. The dog spends hours each day visiting patients at retirement homes, joining special needs kids for a library reading program and comforting patients at nursing homes near Stouffville, Canada. For the past seven years, Smiley has been teaching people not to dwell on a disability, where you came from or what happened to you as a child. One of Smiley’s visits to the nursing home was particularly memorable. Teddy, a man that Smiley frequently visited in a nursing home, had no speech and was unable to communicate. But that didn’t stop the dog from trying. Now every time Smiley visits the nursing home, Teddy is the first person he sees. “I think that’s when I realized how truly inspiring he can be,” George said. George said the now 12-year-old dog’s life is slowly coming to an end. Smiley’s changed the lives of hundreds of other men, women and children as well.